Earn eighty cents an hour by delivering groceries with instacart! What is Instacart actually offering? What is Instacart actually paying? 2/6/19 — HUGE update: Instacart announced they are going to stop taking tips, raise their minimum batch payment, and even pay backpay. Click here to sign on and tell gig companies it’s time to #PayUp. Instacart’s shady practice of taking tips has started to get the attention it deserves, and shoppers across the country have been sending in screenshots that show just how messed up the company’s pay system is. Do you have screenshots like this? Share them with us so we can add them to the list & help make the case. 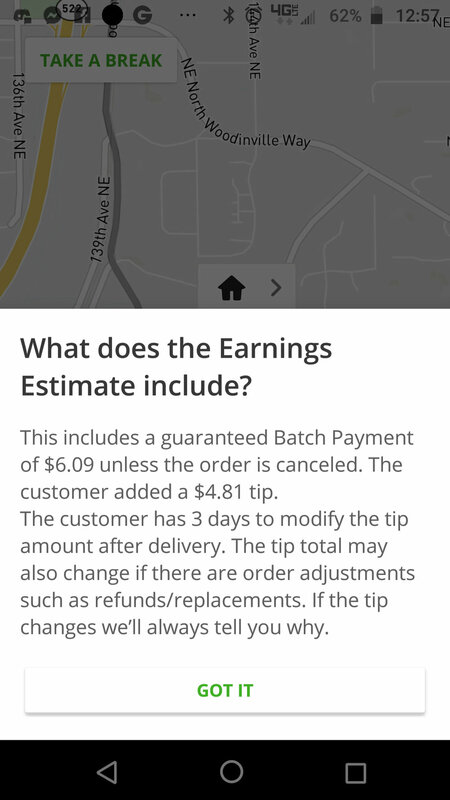 This screenshot from Phoenix shows Instacart paying just $1.23 for a job that took 62 minutes, and using the customer’s tip to make up the rest. The mileage reimbursement was more than the pay! If the customer had tipped $0, Instacart would have had to pay more. Again, the tip is going to reduce the company’s cost, not adding to the worker’s income. This screenshot shows a job that took 127 minutes — more than 2 hours — where Instacart paid just $6.72. Obvious explanation: the customer tipped $25. This screenshot shows a job that took more than two hours. Instacart paid just $2.51 for the job (plus $2.94 in mileage). The customer initially tipped $4.55, but then took that tip away. Leaving the worker with just $2.51 in pay for two hours of work. 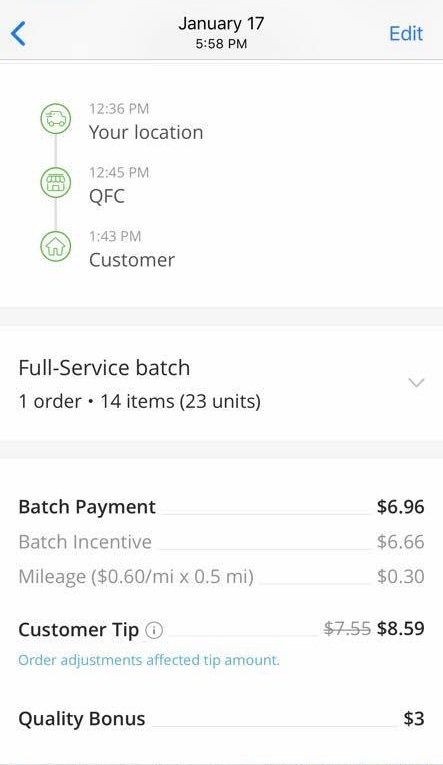 This screenshot from Alviena, an Instacart shopper in Olympia, shows Instacart paying just $6.66 for a job that took an hour and seven minutes. That’s a pay rate not much more than half of WA’s minimum wage — before you even consider the expenses the worker covers. How do they get away with that? The customer tipped $8. And that tip money let Instacart pay less. In other words, the customer was tipping the company. The customer actually paid more than the company did! These two screenshots show similar jobs worked the same day, one after the other — one with 22 items, then other with 20 items. The total from each job is pretty similar, too: $23.17 and $24.45. But Instacart paid $21.01 for the job on the left — because the customer tipped $0. They paid just $12.87 for the job on the right — because that customer tipped $11.58. The company only about half as much on the job where the customer provided a tip. They paid less because the customer tipped more. Instacart offered this job, shopping and delivering three orders to three destinations, for just $6.72. 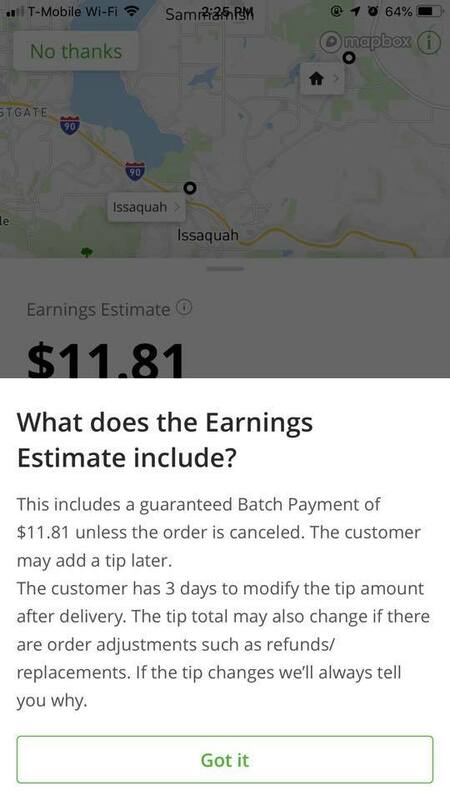 The job would have taken at least an hour, but Instacart lowered their pay below $7… because the customer tipped $11.76. One again, the customer tip is lowering Instacart’s costs, not raising workers’ pay. 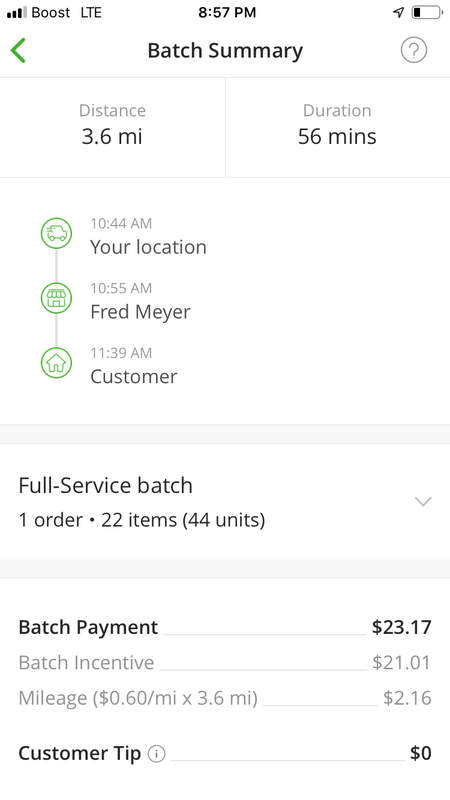 The first screenshot shows a large job (63 items) where Instacart paid $38.84, because the customer didn’t add an up-front tip on the app. The second & third screenshots shows a similar-sized job (53 items) where Instacart offered $23.08 — because the customer tipped $13.54 up-front. These similar jobs were worth about the same in total, the different was that Instacart paid quite a bit less when the customer tipped more. This job (which would have taken about two hours) was offered repeatedly over a single day, with the batch incentive rising from $19.72 to $39.72 as it was repeatedly not accepted. 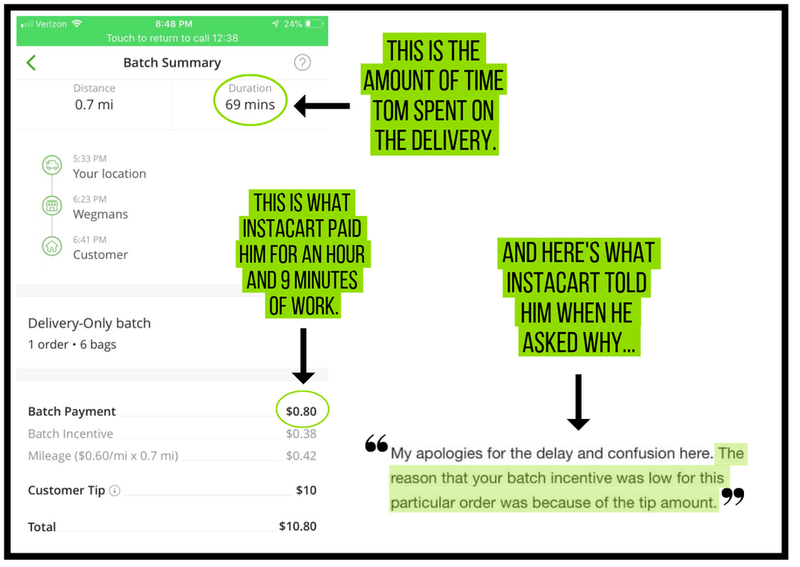 Instacart’s how-low-can-you-go pay model likely delayed this customer’s order, leaving both workers and customers dissatisfied. These screenshots from Ryan show a job he was offered that paid $10.90 total for what he estimated would be about 50 minutes of work. Of that $10.90, $4.81 was the tip and $6.09 was what Instacart paid — a pay rate of $7.31/hour, before factoring in expenses. 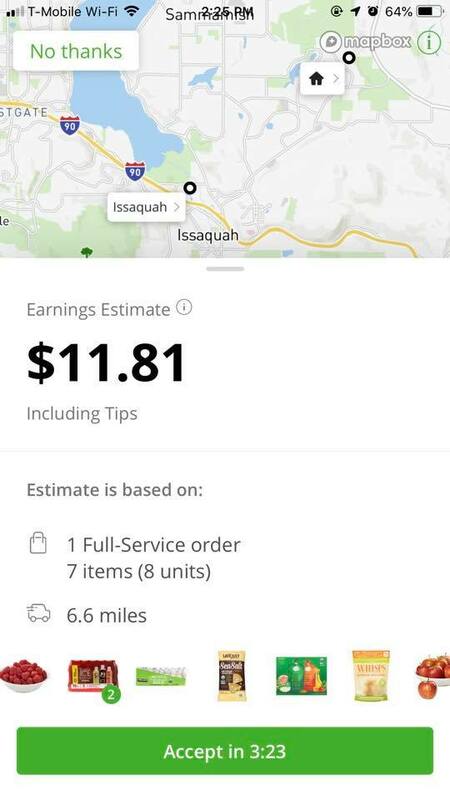 These screenshots from Cassandra show a job offer in Issaquah where Instacart is paying $11.81 for what she estimated would have been up to an hour and a half of work (30-45 minutes to get to the store, and another 45 minutes spent shopping and delivering the groceries). That’s a pay rate of $7.87 per hour, before factoring in expenses. This pair of screenshots posted by Matthew Telles shows two versions of the same job. One had a $6 tip attached, then other a $2 tip… so the batch incentive Instacart paid was exactly $4 less. The worker got the same amount (before the $3 “quality bonus” for getting a 5-star rating). These screenshots from Miranda in Spokane show a batch where Instacart offered just $6.72 for about an hour’s worth of work. It also shows Instacart using the tip to bring them up to the bare minimum they say will be offered for any job — $10. These two pairs of screenshots show two instances in which a shopper got an offer, rejected it, and saw it come back minutes later for a slightly higher amount. They’re evidence that Instacart’s “algorithm” that they say takes many different factors into account is really just based on paying as little as they can get someone to take a job for.